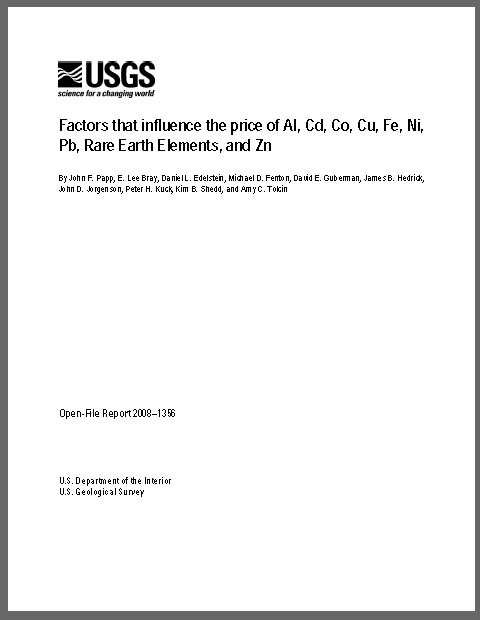 This report is based on a presentation delivered at The 12th International Battery Materials Recycling Seminar, March 17-20, 2008, Fort Lauderdale, Fla., about the factors that influence prices for aluminum, cadmium, cobalt, copper, iron, lead, nickel, rare earth elements, and zinc. These are a diverse group of metals that are of interest to the battery recycling industry. Because the U.S. Geological Survey (USGS) closely monitors, yet neither buys nor sells, metal commodities, it is an unbiased source of metal price information and analysis. The authors used information about these and other metals collected and published by the USGS (U.S. production, trade, stocks, and prices and world production) and internationally (consumption and stocks by country) from industry organizations, because metal markets are influenced by activities and events over the entire globe. Long-term prices in this report, represented by unit values, were adjusted to 1998 constant dollars to remove the effects of inflation. A previous USGS study in this subject area was “Economic Drivers of Mineral Supply” by Lorie A. Wagner, Daniel E. Sullivan, and John L. Sznopek (USGS Open File Report 02-335). By seeking a common cause for common behavior of prices among the various metal commodities, the authors found that major factors that influence prices of metal commodities were international events such as wars and recessions, and national events such as the dissolution of the Soviet Union in 1991 and economic growth in China, which started its open door policy in the 1970s but did not have significant market impact until the 1990s. Metal commodity prices also responded to commodity-specific events such as tariff or usage changes or mine strikes. It is shown that the prices of aluminum, cadmium, copper, iron, lead, nickel, and zinc are at historic highs, that world stocks are at (or near) historic lows, and that China’s consumption of these metals had increased substantially, making it the world’s leading consumer of these metals. Papp, J.F., Bray, E.L., Edelstein, D.L., Fenton, M.D., Guberman, D.E., Hedrick, J.B., Jorgenson, J.D., Kuck, P.H., Shedd, K.B., and Tolcin, A.C., 2008, Factors that influence the price of Al, Cd, Co, Cu, Fe, Ni, Pb, Rare Earth Elements, and Zn: U.S. Geological Survey Open-File Report 2008-1356, 61 p.